A full-service Chicago interactive marketing firm, Proceed Innovative LLC helps companies extend brand awareness and drive sales through interactive marketing strategies, search engine optimization (SEO), pay per click (PPC) training, PPC management, creative SEO web design,website promotion and web analytics consulting. Today, the Internet is the most measurable, results-driven mass-marketing vehicle available. From the start, Proceed has been at the forefront, helping customers find powerful new ways to use the Internet to extend their brands and drive sales. Proceed Innovative offers its customers unmatched expertise across all key interactive marketing disciplines, enabling companies to consolidate all marketing initiatives with one trusted team of professionals. 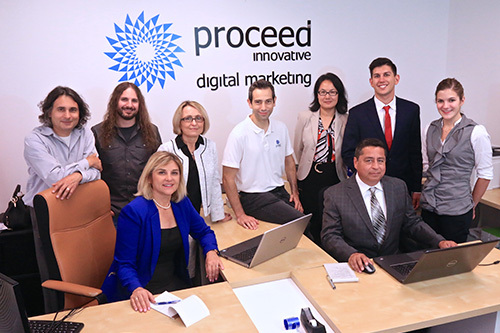 Proceed specializes in delivering its innovative interactive marketing solutions to Fortune 1000 companies, as well as those in the travel & hospitality and consumer services vertical markets. Proceed’s interactive marketing professionals have in-depth knowledge of the opportunities and challenges that companies in these spaces face, enabling them to develop highly targeted, highly effective marketing campaigns that are proven to deliver results. Proceed continuously evaluates client interactive marketing campaigns and performs ongoing search engine marketing campaign maintenance and modification. Proceed is a Google Partner and has access to information, training and tools available only to Google partners.